Like I said in part 1, our letterboxing adventure was a bust, but the weather and scenery were awesome. We took our time exploring. We would drive for a little while and when we came across a trail we wanted to explore or a certain area where we wanted to take pictures, we would just stop. We spent some time at a picnic area where the boys had fun skipping rocks. One of my most favorite parts of the trip was discovering Donley Cabin. We looked for the cabin hoping to find a letterbox, which of course was not there. The hike in just to see the cabin was well worth the trip. Getting to the cabin is an adventure in itself. The drive is mostly on a gravel road. It seemed like we drove for an hour on that road before we reached the pull off. Once we reached the pull off we had to hike about 1/4 of a mile to the cabin. 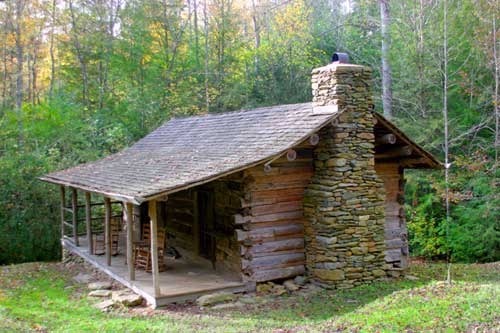 Donley Cabin is a historic 19th century 2-room log cabin that was home to Jack Donley (1846-1941). From what I can find, a man had built the cabin (1-room at the time) during the 1860s so that he could hide from being asked to be a soldier in the Civil War. Jack Donley purchased the cabin and some of the land after the war. The cabin is available for rent, so if you want the primitive experience this is it. There's no electricity and you have to carry everything in. The best part: when you have to do your business there's an outhouse available for you convenience. This year's trip to the Cherokee National Forest was great. I'm excited to see where our next trip to the CNF will take us!